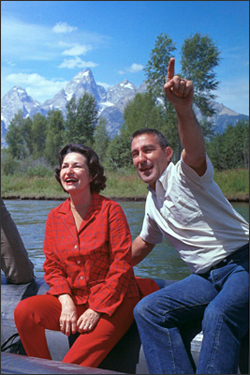 With Stewart Udall’s recent passing there have been many powerful obituaries (e.g; Washington Post, Mar. 21, 2010) noting the amazing heritage that Stewart Udall left, particularly in his service to the nation as Secretary of the Department of the Interior (DOI), under the Presidential administrations of John Kennedy and Lyndon Johnson. His contributions to our National Parks and protection of our natural resources were indeed remarkable. However, one critical aspect of Secretary Udall’s contributions to U.S. society and technology appears to have been missed by many reporters. In the early 1960s, as the space race with the Soviet Union continued to heat up, many USGS (U.S. Geological Survey, a DOI Bureau) scientists—under Dr. William T. Pecora’s direction—became increasingly involved with NASA and the U.S. Department of Agriculture (USDA) in the application of newly evolving “remote sensing” methods of monitoring the Earth’s resources. By the mid-1960s NASA’s plans to develop a land satellite observatory were still slowly evolving, with most of NASA’s attention focused on the Apollo missions. Dr. Pecora and his USGS team, recognizing the immediate value of satellite-acquired land observations, became increasingly anxious that a satellite land observation system be developed and deployed for agencies such as DOI and USDA. By 1966, Dr. Pecora had convinced Secretary Udall that DOI should announce plans to develop their own satellite system, the Earth Resources Observation Satellite (EROS). This probably was done in part to get NASA to pay more attention to the mission. He prepared a memo for Secretary Udall that explained why USGS and DOI needed EROS to monitor land cover dynamics. Announcement of a USGS-led EROS program took place on September 21, 1966. Curiously, the Secretary was on a rafting trip down the Colorado River with his good friend Ladybird Johnson when this announcement was made. The Udall announcement created a storm of political protest from NASA and Defense agencies, neither of which wanted another competitor in the Earth observations business. Rumor has it that President Johnson, furious with the resulting controversy, never spoke with Secretary Udall again. Nevertheless, the Udall EROS announcement did capture considerable Washington attention, which led NASA to begin development of the Earth Resources Technology Satellite (ERTS) in 1967. ERTS-1 was placed into orbit on July 23, 1972 and renamed Landsat 1 in 1975. The Landsat mission has been operating continuously since that time, documenting the Earth’s land dynamics—through six individual observatories—for nearly 40 years now. Landsat data are archived at the USGS National Satellite Land Remote Sensing Data Archive (NSLRSDA) held at the Earth Resources Observations and Science (another EROS) Center in Sioux Falls, South Dakota. This observation record provides the only permanent, continuous basis for understanding the Earth’s land dynamics over the last half century. Not only did Stewart Udall raise our concerns about the Earth’s environment and resources and take steps to preserve some of the most beautiful areas of our country, but he also took the politically brave steps needed to ensure that we used our new space technologies to monitor the Earth’s land areas. We are only beginning today to appreciate the magnitude of this important contribution to understanding the recent history of our evolving uses of our critical land areas—a truly amazing contribution to our future generations.